Victory! (It only took 7.5 months to complete.) It has been said a gazillion times already, but this is a fantastic pattern. I can’t remember why or how I lost momentum with this one. 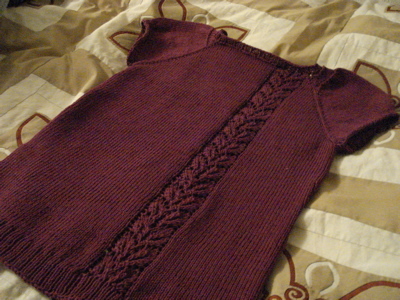 I literally had about 3 inches of the body left to knit before the ribbing on the waist, sleeves and neckline. 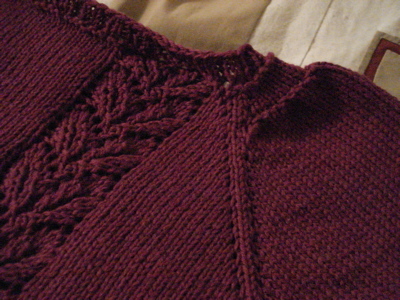 I made one sort of intentional modification: instead of picking up the same number of stitches for the neckline ribbing, I picked up about 15 fewer, ostensibly to stop the rolling and to help the lace lay flat. The overall fit is accurate, in that I made the medium (36-39) and I have a 38 inch circumference. This baby is blocking now, and because of the cotton in the yarn, I’m confident that it will relax ever so slightly. Modeled FO pictures once it is dry.